It’s a common enough pastime, taking a stroll with the family. It seems that any family taking a walk along the beaches of Norfolk (East Anglia, England), in the spring (presuming we ever get a spring after all the stormy weather), might just be mirroring events that took place between 800,000 and perhaps as long ago as one million years BC. Scientists have discovered ancient, hominin footprints at Happisburgh on the Norfolk coast. The footprints left in the Pleistocene mud and preserved thanks to rapid burial, represent as many as five individuals, these might have been made by a family group exploring the banks of an estuary for food. This discovery is hugely significant for palaeoanthropologists, as these are the oldest footprints found to date outside Africa. Stone tools have been found in the UK and elsewhere in Europe which have been tentatively dated to around these dates but this is the first trace fossil evidence of hominins being present during the latter stages of the Late Calabrian, (Early to Mid Pleistocene) in what was later to become the British Isles. Sometimes scientific discoveries are made after a great deal of research and painstaking effort, but in this instance it was sheer luck that the impressions were spotted and identified. Rapid coastal erosion of the surrounding cliffs has exposed large portions of the underlying estuarine muds and silts that form part of a formation known as the Hill House Formation. These sediments were laid down by large, slow-moving rivers during the Early to Mid Pleistocene. These exposures have been explored as they reveal important information about the fauna and flora during what was a relatively warm, interglacial period for this part of Europe. In early May 2013, a layer of compacted silt was exposed by tidal action. A cursory examination of this layer, by one of the researchers studying the Pleistocene ecosystem, revealed a series of hollows and other impressions that resembled human footprints that had been preserved in Holocene-aged horizons. The area, approximately twelve metres square, was then extensively mapped and photographed. The surface of the exposure was assessed using multi-image photogrammetry and laser scanning to record the pattern of the impressions in extreme detail. The team had to work fast as each time the tide came in the site was covered over and the silts exposed to erosion. Within four weeks, the surface in which the prints had been found had become completely eroded. All evidence of ancient human activity had been destroyed by tidal action. First of all, an ancient human must walk over a soft substrate of the right consistency to make an imprint. There must be minimal erosion of the imprinted surface as it is exposed, the print must retain its shape and details. Rapid burial must take place to help preservation, but such burial must be carried out without the print itself becoming too misshapen or eroded. Such rapid burial comes about when material is laid over the print by slowly flowing/rising water or by air fall deposition such as volcanic ash – the 3.6 million year old Australopithecus prints discovered at Laetoli (Tanzania), for example. Last but not least, the preserved impressions then have to be exposed and recorded before being eroded away, in this case it took less than a month for the elements to totally destroy the footprints made as far back as a million years ago. Heel and foot arch ridges have been identified, one print even had the outline of toes preserved. But actually who made these prints, presents the research team including archaeologists from John Moores University (Liverpool), the University of London and the University of York, with a bit of a challenge. One candidate is the enigmatic and very poorly known Homo antecessor (Pioneer Man). H. antecessor is the second oldest hominid species to have been found in Europe. This species of hominin is known from fossils excavated from sites in Atapuerca (northern Spain). The fossils have been dated from around 1.2 million years ago to 800,000 years ago, so H. antecessor is known to have been in Europe (albeit one thousand miles away), when these tracks may have been made). 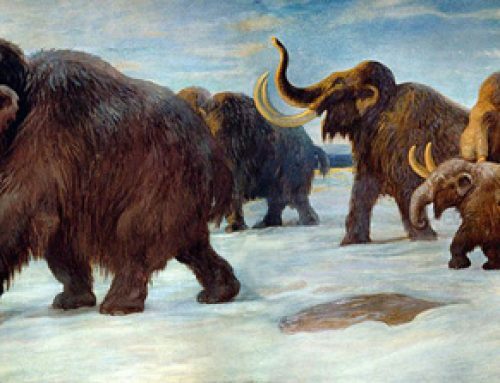 By carefully measuring the length of the footprints, the scientists were able to establish that the individuals who made these impressions measured from around 0.93 metres tall to a height of 1.73 metres. To calculate the height, the research team used a standard hominin ratio measurement based on the foot length being approximately fifteen percent of the height of the person who made the print. Camera lens cover provides scale. With the variation in heights plotted, the scientists have speculated that this could have been a family group foraging together. At the time the prints were made, sea levels world-wide were much lower than they are today, the group of hominins whose prints had been found on the Norfolk coast, had actually been walking along the banks of a large, slow-moving estuarine river several kilometres inland. The river system formed part of the massive Thames drainage basin, a forerunner of today’s course of the River Thames and its tributaries. The largest print has been ascribed to a male and based on this height evidence the prints do fit within the framework of reference associated with Homo antecessor, so in the published academic paper, the footprints are tentatively assigned to H. antecessor. However, the authors do note that during the Early to Mid Pleistocene at least two other species of hominin were present in Europe. Evidence for Homo heidelbergensis is known from Germany and West Sussex, fossil material and other artefacts indicate that H. heidelbergensis was present in Europe from around 600,000 years ago. In addition, early Neanderthals Homo neanderthalensis remains have been recorded from Sima de los Huesos in Spain, the same vicinity from which Homo antecessor fossils have been excavated and from Swanscombe (Kent, south-east England). The Happisburgh footprints are the oldest hominin tracks to be discovered in Europe to date. Prior to their discovery, the oldest prints known were the “Ciampate del Diavolo”, the “Devil’s footprints”, a series of tracks preserved in volcanic ash discovered in the Roccamonfina region of central, southern Italy, about 35 miles north-west of Naples. These prints indicate individuals around 1.5 metres in height and it has been speculated that these tracks were left by a group of Neanderthals. The Italian prints are estimated to be around 345,000 years old (Mid to Late Ionian). Anyone imagining what it would be like to travel back in time the best part of one million years to meet these ancient hominins needs to take heed. Cut marks on H. antecessor bones from the Spanish site (Atapuerca) indicate that at least one group of these ancient humans were cannibals.